Home / contest / CarConnect : Indian Car lovers, rejoice! That’s the thought that comes to mind after reviewing CarConnect, the new site for car aficionados. Like many others, I too ventured into the site not knowing what it was about as it was my first time there. That lack of pre-conceived notions worked well to my advantage as I pressed each of the main buttons though, reading post after post & following articles and opinions. Car Connect looks to bring together car lovers from across the entire country under a single platform and have them speak out about their experiences, opinions and journeys. Here, you are the speaker - talking about your passion to an audience who understands the value of words like ABS, horse power and long drives. The layout of the drive deserves credit – it’s fairly self-explanatory and easy to use even for a first-timer. The SHARE EXPERIENCE button leads you to a page where you can choose to either write about your experience with a particular car or conversely, describe a journey you undertook with your car. Options are also available to add pictures and even videos to help showcase your four wheeled beauty to others who drop by. b) the destination of the journey. 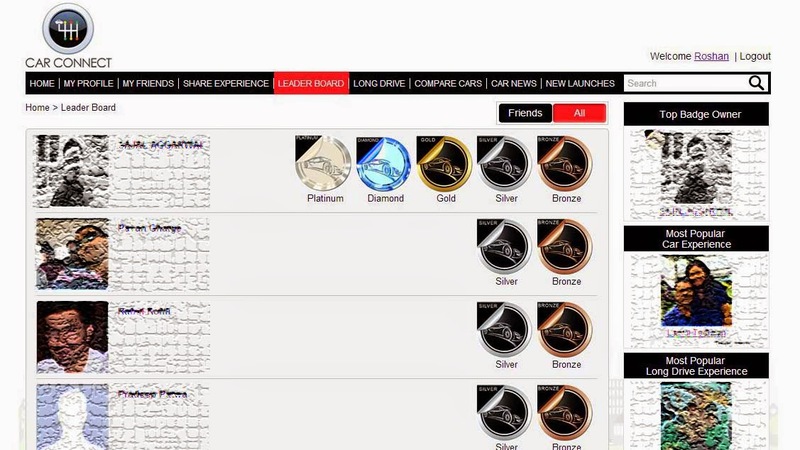 Click on any of the names visible and you can go directly to all entries for that particular car or place. Conversely, you can also find more places by clicking the LONG DRIVE button. But is it only about us doing the talking? No, not quite. And this is where I am truly impressed. The site goes the extra mile ( no pun intended ) to make your journey to know more about cars in India fruitful. 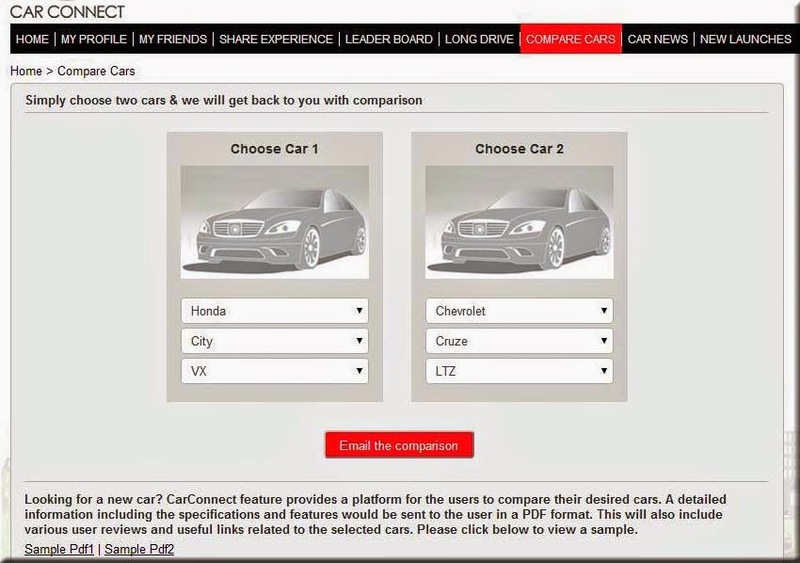 The COMPARE CARS feature is an absolute treat here – simply select the make and model of the two cars you wish to compare and the site sends you a personalized detailed description of both cars, complete with opinions on the new features available, pictures of the interior and exterior of the car and finally external links from trusted review sites for the cars. I really love this feature. As a guy who pondered for nearly eight months about the pros and cons of each and every hatchback, I know how much a person looking for a new car would truly appreciate this. There is also a CAR NEWS and NEW LAUNCHES feature which is up-to-date and concise, letting you know what’s coming and what’s up in the car market presently. For direct interaction with others and making new friends, there is a handy CHATROOM button too akin to most social chat interfaces where you can directly ask your queries or speak your mind. Your written experiences too add to your social aura by moving you up the ladder in the LEADER BOARD, every 5 experiences earning you a new badge. All in all, I had a great time here and I sincerely believe you will too. It’s highly recommended for those who are passionate about cars and would love to discuss it with fellow lovers of the non-Transformer variety four wheelers. It is also for those who are looking out for new cars – besides the personalised car model comparison, the new launches and news sections are something you may want to keep your eye on at regular intervals. I sincerely wish I had a site like this while deciding which car to buy and I’m really glad that someone finally decided to make a forum like this for the public. Author's note: This is my entry for Indiblogger's CarConnect Experience Contest. check it out.. quite a few good features there..
As I have no fascination for cars, I will give this one a miss. I am used to Team BHP for my road journey reviews. How does this compare to that one? Nice write-up, Roshan. Positives for Team BHP: Their own reviews of cars are exhaustive and extremely detailed. Positives for CarConnect: I found it easier to navigate in certain areas, especially when it came to using the CLOUD widget to read experiences based on cars and destinations. The instant messaging and chat feature is also a major plus. Looks like a great tool to take the guess work out of buying a car! It is quite nice. The compare cars feature is really nice that way, I feel. Saves us a lot of searching online! Its a really very useful and impressive blog for me. I really like reading this blog. Thanks a lot for sharing.